IT finance solutions that click. Keeping pace with the most effective IT solutions is vital for today's small to medium sized businesses. So to ensure you remain a step ahead, Fidelity Finance Group provides the latest in IT finance solutions. With extensive experience in business computer leases and systems, Fidelity Finance Group can offer a range of business finance options, from a single business computer lease, IT rental plans, to hire purchase. Rental solutions that pay off. Fidelity Finance Group has created a dedicated division called that can create IT rental packages. We work directly with IT equipment vendors and with end users. We also offer business finance on Satellite Navigation systems, to keep your staff headed in the right direction. 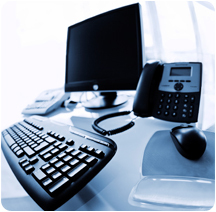 Or talk to us about telephone system rentals that can open up new lines of communication for your organisation. Fidelity can help you acquire the technology you need now, and even assist with disposing of it in the future. So when new thinking comes along, you can move seamlessly into a more effective solution, with minimum hassle. Whether you're looking for entire business computer systems with servers, hardware, networks and software, or want a single business laptop, Fidelity Finance Group can help. We've teamed up with IT equipment vendors and end users, servicing their ongoing needs in a changing world. Fidelity Finance Group is like your IT Finance search engine, as we search for the best solution from over 20 lenders. In addition, our $350 million in loans written annually give us the bargaining power to negotiate preferential rates and terms on your behalf. You'll recieve personlised service from our IT business finance experts, from application to settlement. You're under no obligation to use our IT finance once it's approved. We arrange AUTOMATIC approvals within 2 hours of transations up to $30,000. Fast approvals within 24-48 hours on transactions from $100,000 to $250,000. Fidelity Finance Group liaises with the supplier of your choice, orders the invoice and prepares all the paperwork ready for your signature. We pay the supplier, you receive the goods, it's that easy. Complete an IT finance application now, without obligation, click here. Or phone +61 (2) 9212 0799 to talk with one of our business loans experts.